The Jumping spider lives in a variety of habitats. Although most commonly discovered in Tropical forests, they are also found in temperate forests, scrub lands, deserts, intertidal zones, and mountains. Generally recognized by their distinguishable eye pattern, all jumping spiders have four pairs of eyes, with very large anterior median eyes. 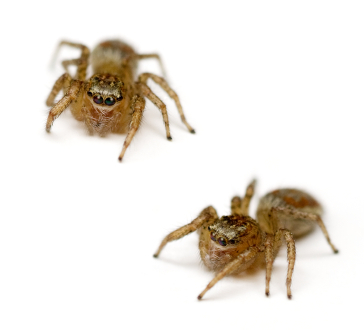 Most Jumping spiders have these eyes arranged in three rows, with the exception of the Lyssomaninae species; which has four rows (one for each pair). 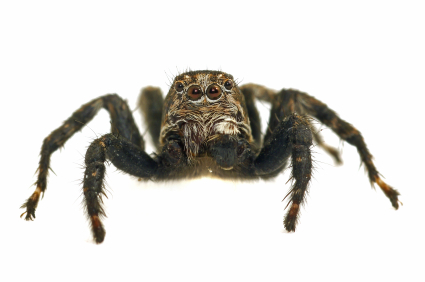 Different from other species of spiders, who rely on hairs for proximity detection, the Jumping spider uses its secondary eyes; to detect nearby entities. Having ascertained the presence of a nearby trespasser, Jumping spiders will curiously turn to examine; and try to identify the intruder as prey, threat, mate or a natural phenomenon. Jumping spiders are active hunters. Remarkably, this spider species does not rely on a web to catch prey. Instead, these spiders stalk their victims. Utilizing superior eyesight to distinguish and track intended prey, they quickly attack, leaving insects little time to react; before succumbing to the Jumping spider’s venom. According to pest control professionals, their incredible speed is accomplished by a well-developed internal hydraulic system; which extends their limbs by altering the pressure of body fluid. This enables them to jump (up to) forty times the length of their own body. As well, when leaping from destination to destination, the Jumping spider will secure itself with a silk tether; to prevent a fall. Although spiders are generally carnivorous, there are some species of Jumping spider that include nectar and pollen; in their diet. Notably, there is one species (the Bagheera kiplingi), which feeds primarily on plant matter.